I apologize again as I do not feel comfortable telling literally anyone what animals I own. I am just really weird about that for some reason. I know it is stupid but I don’t really like when I tell one person and then they tell a bunch of other people and the word spreads when it is not their business to be telling people, it’s happened to me before. Sorry again. Let’s just say that they aren’t reptiles of any kind. Each of us has unique sharing levels. Just be YOU! Be comfortable! Just a quick update before I go to bed as today has been a busy day for me. I was able to go to home hardware and get a small pvc pipe to put in his enclosure for him to hide in and climb on. It is a equal tee pvc pipe. I have attached a photo of it below. Thanks. You've been quite timely replying to our messages! Does your hardware store also sell long PVC tubes? I'm thinking about a ~3.8 cms (1.5 inch) diameter x ~40.6 cms (16 inches) long tube. This will give your crestie a good forever hiding place where he can thermoregulate. Lean that diagonally against the sides of his enclosure. Since 2007 my crestie has used a similar one for his "sleeping bag". He climbs right in and out. He's never gotten stuck. 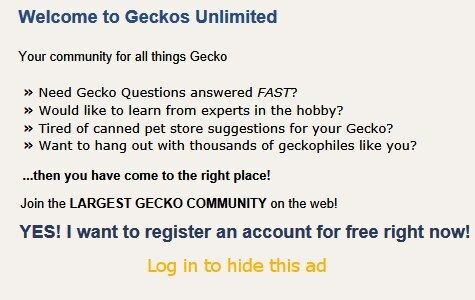 By the way I sent you a private message on Geckos Unlimited. Have you received it? I was going to suggest the same - a hiding place on the ground, a ledge, and another branch (don't use grapewood/grapevine) or vine to fill some of the empty space and provide for more climbing. Food and water bowls look good. Cresties like to be up high when they are out and about. The foliage you have in there is good, but as they grow, might be hard for them to climb on. Keep it in there for hiding though! A cork tube, if you can find it in a pet store, is very good as it handles humidity well. Hollow bamboo also works. Twisty vines work great. Last edited by GeckoLeen; 04-01-2019 at 07:55 AM. Yeah, I'm sorry about that. I am very busy during the day and then when I get home I just want to sleep. MY weekend was also very busy this week so I haven't really had the time to reply to anything. I will have to go back to the hardware store and see if I can get the crested gecko a long pvc pipe. He does have a long paper towel roll that is leaning up against the side of the enclosure. I will try to get a new photo of the enclosure when I can so you can see. At the moment, he likes to just hang out in the foliage or on the wall behind it. Last edited by ccrested; 04-01-2019 at 10:53 PM. I totally forgot to update you guys and also to take an updated photo. I have been really busy lately and a lot has been happening so I guess it just slipped my mind. This is an updated photo of the enclosure. I did add a sturdy tube that came from a parchment paper roll and I leant it up against the side. He still prefers to just lay among the leaves though but that’s okay. Cresties love to climb as high as they can. During the day my crestie hangs out on his "basking bar" near the screen top. I used to do school outreaches. One fine day I thought everything was a go. At lunch I noticed the small travel enclosure's door was ajar. George was nowhere to be found. We searched high and low. Suddenly I saw George staring down on us. He was perched on top of an upside down 10 gallon on top of a 6 foot tall storage cabinet!!! Soon we got a ladder. I climbed up and "rescued" George. I was elated! George probably felt "caught". I also forgot to mention, I’ve been feeding the crickets (I only have 3 left somehow but I can get into that some other time) flax seed and almond as it says that is okay for them to eat in the food list along with their high calcium food. One of the crickets is really big and has developed wings of some sort, quite interesting actually.